still going through pics of fashion week, i came across above pic of the great australian swimmer, ian thorpe. 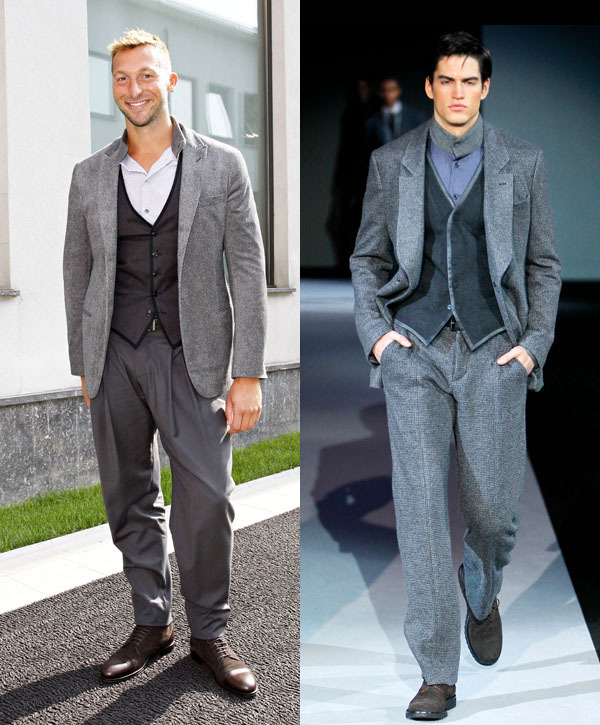 the thorpedo attended the giorgio armani show in milan last week, and was dressed head to toe in giorgio armani menswear fall winter 2011.
it is often difficult to dress sportsmen. masculine physique doesn't usually translate well with runway pieces, but i am honestly wowed by mr. thorpe. he looked really good, the clothes fitted well and he modelled the outfit much better than the model. great pairing, and with the thorpedo returning to compete at the london 2012 olympics, could this be a hint that he will soon be joining raphael nadal on the armani underwear campaign?